When you conjure up an image of a kindergarten classroom, what do you see? In my mind, there are ABCs and 123s and primary colors everywhere you look – red apples, yellow buses, blue birds. Colors are part of the kindergarten core curriculum as four and five year olds navigate their first official school experience, expressing themselves with brightly colored blocks, crayon and PlayDoh. For our kindergartners, identical triplet boys who have just been separated for the very first time, colors take on a whole new meaning. We’ve used red, blue and green to tell them apart since birth. In the early days, we relied on nail polish on each of their big toes. As they grew, they got sippy cups in their “signature” colors. We dressed them primarily in their “primary” colors and even today the crocs they wear are red, blue and green. 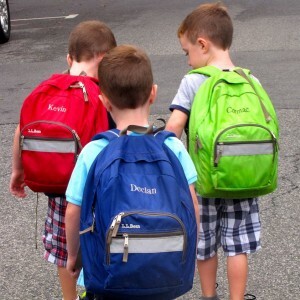 It only seemed fitting then that as they marched off to kindergarten, their backpacks were, of course, red, blue and green. We’ve had inklings in the past that perhaps color-coding our children would present some issues. There was the time that when asked what his name was Declan responded, “I’m blue!” And truly, of our three little fellas, he’s a bit more “blue”, a bit more melancholy than the rest. Then there was the time that Kevin proclaimed he is a Red Sox fan – because his color is red. This one really did a number on my husband, whose only mandates for our children is that they “grow up to be Catholics and Yankee fans.” Crazy, I know, but still the Red Sox thing really hit him where it hurt. The latest evidence of what seemed like a smart survival tactic gone awry happened during Cormac’s first week of kindergarten when he was asked to draw his self-portrait. It was green. ALL green. Good grief, what have we done?! His teacher is now committed to ensuring he “likes all colors” before the school year is over. As for the rest of the others, well, we hope they learn to like all colors too. And, we’re thinking that maybe some new backpacks wouldn’t be such a bad idea either!